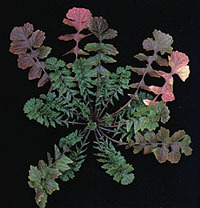 Growth Habit: Hedge mustard is a moderately competitive plant. Its hard, wiry stems which grow erect, can reach up to 1m. Type of Plant: This weed is an annual, initially forming a rosette. Flowers: Hedge mustard has 4 petalled, yellow flowers, 3-4mm in diameter. These are arranged in clusters. Fruit/Seed: Seeds are housed in seed pods 10-20mm in length. These are located close and parallel to the stem. Several hard brown seeds are contained in each pod. Dispersal: Reproduces from seed. Seed is mainly dispersed by soil movement and by machinery, particularly harvesters. Distribution: Found in waste places, roadsides, orchards, cereal and vegetable crops. Can be a significant weed of crops, particularly brassica crops such as canola. Herbicide (autumn, winter and spring). Herbicides registered in Tasmania include metsulfuron, glyphosate, dicamba, MCPA and mecoprop. Consult the D.P.I.W.E. for more specific information if the weed is in a crop.